"There was gold everywhere", he told everybody when he came back after the first flight. Jimmy Angel and McCracken his partner worked quickly, stuffing pockets and bags with more than 45 kilos of gold ore from the Tepuy mother lode, (A rare site today but is confirmed that in many parts of South America these where discovered by the Indians). Daylight was fading fast. Realizing they had to get off the mesa before nightfall, they slung the gold aboard Mr. Angel's airplane and took off. They never made it back. It was in 1924. Mr. Angel spent the next 32 years of his life searching for the treasure. Mr. Angel's bittersweet quest had begun three years earlier, when the 22-year-old Missourian met an old Alaska-born prospector named J.R. McCraken in a bar in Panama. Over drinks, Mr. McCracken inquired about Mr. Angel's flying credentials. I hear you're the one who can land on a dime,'' the old prospector said. 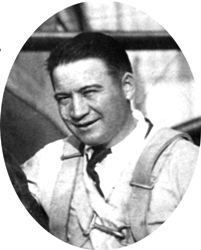 I'm your man,'' Mr. Angel replied, pointing out that he had once flown with Charles Lindbergh flying circus. Mr. McCraken then told him a fabulous story about gold along the border between Brazil and Venezuela - a remote mountaintop covered with more gold than he could possibly imagine. (similar stories was told by a Portuguese expedition from 1640 that spend more that ten years exploring the area between Venezuela and Brazil. Colonel Fawcett was one of the persons that first discovered this rare document in the national archives in Sao Paulo. It took several years for the two to make arrangements for the quest. Mr. Angel's up-front fee was $5,000, which he used to purchase the his airplane. After refueling in Ciudad Bolivar on the Orinoco River, they flew to the south, McCraken guiding him through the cloud-topped mountains. They finally flew over a series of flat-topped mountains. McCraken using the Spanish dip needle or a miners compass easily picked out the right spot on the flat sandstone Tepui and told him to land. They jumped out and surveyed the incredible scene. All around them streambeds glittered with gold ore.
McCraken the old prospector from Alaska became sick a few days later and died. Mr. Angel was beside himself with grief. Not only was his partner dead, his chances of finding the mountain of gold again were slim with out the knowledge of locating gold ore.
Mr. Angel spent the rest of his life searching for that gold-peaked mountain. His years of exploration made him famous and yielded some interesting discoveries, including a waterfall found in 1935 while flying for the Case Pomeroy Co. as his sponsor over a tepuy, or tabletop mountain, in the highlands of Guyana Venezuela. The waterfall, known today as Angel Falls in the aviator's honor, cascades more than 3,000 feet, making it 15 times higher than Niagara Falls and the steepest waterfall on Earth. In 1937, Mr. Angel got married again and with new funds he returned to the falls and attempted a landing on top of the tepuy. The plane nose-dived when it hit soft ground, and it took him and his three companions 11 days to hack their way down to civilization. 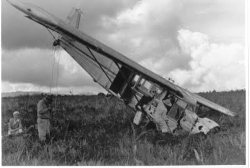 The plane remained atop the mountain for 33 years. In 1970 it was hauled out by helicopter and is now on display at the Aviation Museum in Maracay, Venezuela (see photo). It is said in Venezuela that the Kerepaküpai Merú (Angel Falls) first was reported in 1910 by a Venezuelan naval officer, and gold prospector, Ernesto Sánchez La Cruz. In 1956, Mr. Angel took off on his last mission to find the gold. A crosswind flipped his small Cessna as it taxied down a runway in Panama, causing massive head injuries. The legendary pilot died a few days later, on Dec. 8.